Being Redirected to the New Site...: Got Allergies? Dairy allergies are more common than one may think. I'm allergic to dairy, and although it was awful at first, cutting dairy out of my life has greatly benefitted every aspect of my well-being. For more than six months before I went vegan, I was experiencing strange symptoms that really affected my everyday life: rashes, numb and tingling lips, and acne (or so I thought). Anyways, getting to the point here, I gave up dairy for about a month after deciding to go vegan. I honestly don't know how I managed to do that because I was definitely addicted to it at the time, and I don't have a lot of will power when it comes to food. (Haha). I somehow managed for that first month, but I slipped up and had a piece of cheese one day. I had completely forgotten about all of my weird symptoms by this point. It didn't take me long after eating that piece of cheese to remember how annoying having numb and tingling lips is, and my face broke out in rashes for two weeks after that. If you suspect that you may have a dairy allergy, you should definitely try to go to the doctor or eliminate it from your diet and see how you feel. Some dairy items seemed to give me more trouble than others: cheese and sour cream were probably the worst, whereas butter didn't affect me all that much. I just don't feel well after eating butter, and it also makes my face break out (albeit less severely). 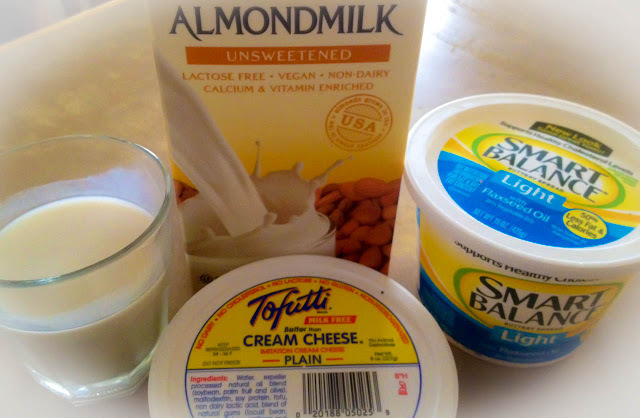 If you just can't break your cheese addiction, try substituting it with nondairy substitutes (a few are pictured above). There are probably another thousand reasons that I'm glad that I gave up dairy: including the mitigation of my Endometriosis and PCOS symptoms. I honestly believe that my Endometriosis (an incurable disease) has cleared up as a result of omitting dairy from my diet. However, I will expand on these subjects later. If any of you have any questions about it, let me know. I would be happy to share my story in order for you to make yours better.